Overview: Sure, there’s a movie coming out next month that is going to pit our two heroes, Superman & Batman, against each other. Anyone can tell a fight story. The real challenge is to tell a story that has the two heroes teaming up to counter some threat that requires both Superman’s brawn and Batman’s brains. And that what we get here with Showcase Presents World’s Finest Vol. 3. Now as with the previous volumes in this series, these are one-and-done type stories with little to no carry-over from issue to issue. Although not officially a Superman book, this title was overseen by the Superman editor Mort Weisinger, and most of the art is done by legendary Superman artist Curt Swan. So you see a lot of characters pop in from the Superman universe, more so than from the Batman universe. There is one new concept that would stick around in various forms for the next decade or so. That concept would be Superman Jr. and Batman Jr., the offspring of our featured heroes. In these stories that take place sometime in the future (despite Batman not aging), our stars have married their co-stars (Lois Lane and Kathy Kane, respectively) and started families. With fathers who are also famous super-heroes, it’s only natural that the boys wear identical costumes to their parents, whether they are 3-years-old or 13-years-old. And no kid is ever a perfect angel, so expect these boys to get into trouble – the kind of trouble that would require a super-hero or two to bail them out. One concept was introduced that we need more of in comics – Bizarro Batman! Again, if you are going to have Batman appearing in a Superman book and facing mostly Superman foes, then it is only natural that a Bizarro Batman makes an appearance. Sadly, he only made a few appearances before fading off into character limbo. But he was around long enough to help Bizzaro create a Bizzaro Justice League. Ponder that thought some while you wait for the next collection! Why should these stories be Showcased? : It’s Superman and Batman. Seriously, I have to imagine that DC turned some kind of profit on each of the Showcase Presents volumes that involved one of the characters. In fact, I would be entirely happy if DC would only publish future Showcase Presents volumes involving one of these guys (but I know that is not going to happen!). I’ve said it before, and I’ll say it again here – the stories presented in World’s Finest Comics are the best Superman and/or Batman stories from this era (late 1964-early 1968). Yes, Batman was getting better in this time, but I still believe his best appearances are in this run. Take a look at the book and let me know what you think. Footnotes: The story from World’s Finest Comics #147 was also reprinted in Showcase Presents Robin Vol. 1. The story from World’s Finest Comics #169 was also reprinted in Showcase Presents Batgirl Vol. 1. 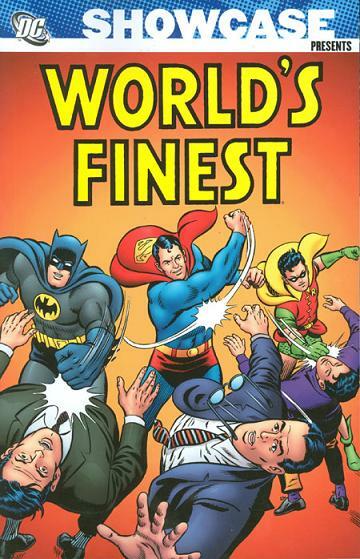 World’s Finest Comics #161 and #170 are reprint issues, and are not included in this volume. If you like this volume, try: the DC’s Greatest Imaginary Stories trade paperbacks released in 2005 and 2010. One of the common types of stories from DC’s Silver Age of comics was the imaginary story. At that time, many of the DC writers and editors were former science-fiction story writers and editors who had made a career out of telling imaginary stories. With an anthology title like Strange Adventures or The House of Mystery, you could tell all kinds of imaginary stories from issue to issue, but it was no big deal. But when you start trying to tell stories involving Superman or Batman, suddenly these become quite important. Some of these stories would completely contradict the overarching story of the character, so it couldn’t be told. Just imagine what would have happened if Bruce Wayne had been raised by Ma and Pa Kent following the death of his parents? Other stories would take the characters in such radical directions that it would disrupt the natural one-and-done nature of each comic. What would happen if Lois Lane married Superman? Could they have children? Would they have his powers? Gradually, as the Silver Age gave way to the Bronze Age, and the next wave of writers, artists, and editors took over the guardianship of the characters, the imaginary stories faded away. Yes, they would be brought back from time to time, even into modern times with many of the works by Grant Morrison or Alan Moore. It’s important to recognize these stories, even if they can be somewhat cheesy. This first trade collects primarily Superman stories, although there are some stories featuring Batman, the Flash, and Captain Marvel. The second trade is strictly Batman stories. This entry was posted in Batman, DC Showcase Presents, Superman, World's Finest and tagged Batman, Cary Bates, Curt Swan, Edmond Hamilton, George Klein, Jim Shooter, Leo Dorfman, Robin, Sheldon Moldoff, Superman, World's Finest. Bookmark the permalink.